It’s that time again – Christmas is coming. For many of us, Christmas is spent with loved ones. But it also offers a unique opportunity for the travel lovers amongst us to experience festivals and events held around the world in celebration of this holiday, which are nothing short of extraordinary. Whatever your travel plans for Christmas this year, whether you’re going home to see family, staying with friends, or simply taking the chance to spread your wings and explore the world with an overseas sojourn, travel in comfort and style with internationally-renowned brands, be it classic French design from world luggage leader Delsey, the latest fashion colours in the Antler UK Juno collection, or luggage designed by Kiwis, for Kiwis, Voyager has a bag for your requirements. “Each year our team travel the world searching for new innovations and fashion trends,” Lance Best, Managing Director at Voyager Luggage says. For Christmas lovers afflicted by wanderlust, there is no shortage of extraordinary celebrations throughout the world. Those dreaming of a white Christmas can pay a visit to annual Christmas celebrations such as the Winter Wonderland festival in Hyde Park, London. With an ice rink, two Christmas-themed circuses, and more shopping than you could shake a candy cane at, this festival is the ideal destination for travelling Christmas enthusiasts. Fans of everyone’s favourite red-suited jolly man can journey to Santa Claus Village in Finland, where the scene is set perfectly with ankle-deep snow and colourful reindeer strewn throughout the forest. There’s even a Santa-themed amusement park not far from the village, making Finland a great place to bring the kids for a bit of Christmas spirit. Or there’s the incredible Christmas Festival of Lights in the USA, where the Catholic shrine known as the Grotto in Portland, Oregon comes alive as it is festooned with over a million Christmas lights, which are hung over a seven-week period. And for those who are dedicated to remembering the religious roots of Christmas, nothing compares to a trip to the birthplace of Jesus himself. Bethlehem, West Bank, just south of Jerusalem, is teeming with devout followers of Christ come Christmas eve, with an unforgettable midnight Mass service in Saint Catherine’s Church on the stroke of twelve. 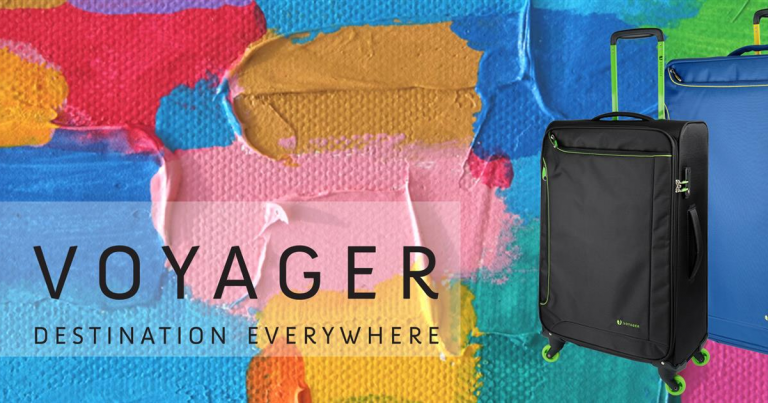 Regardless of your destination, or how far you choose to travel, Voyager can help you take the things that matter most with you, and with their extensive range of products from a wide variety of brands, Voyager makes travelling easy. To find a stockist near you, visit the Voyager Luggage website here!